The theorists published their papers independently in 1964 – the first one by François Englert and Robert Brout, and, a month later, a pair of papers by Peter Higgs. 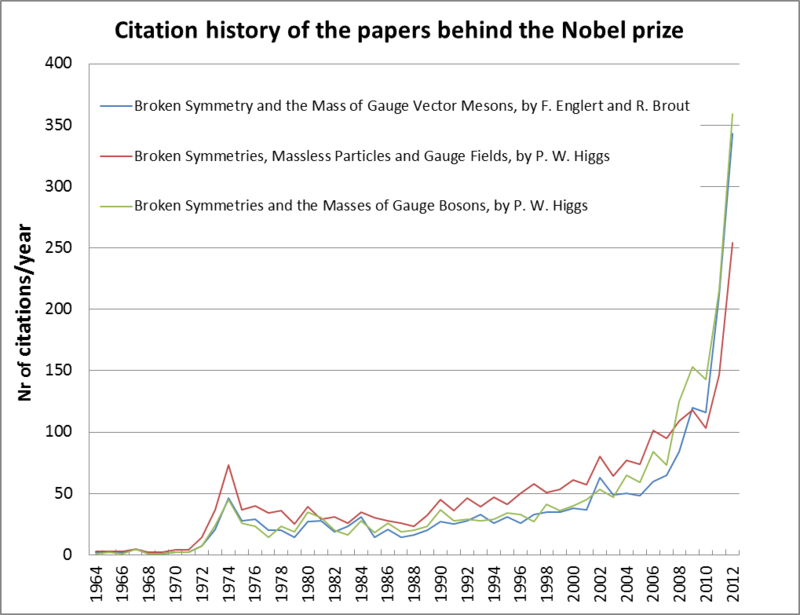 In the graph below you can see the number of citations that each of the papers received yearly since 1964 when they were published, peaking in 2012 with the latest Higgs boson search results. The theories were confirmed on 4th July 2012, by ATLAS and CMS, the two experiments at the LHC that were searching for the new particle. The two collaborations include more than 3000 people each. 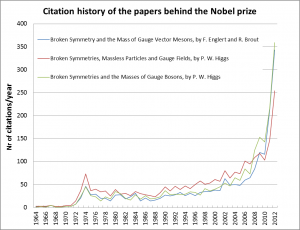 The two papers published shortly after the first evidence presented by the experiments, accumulated enormous numbers of citations in just one year. 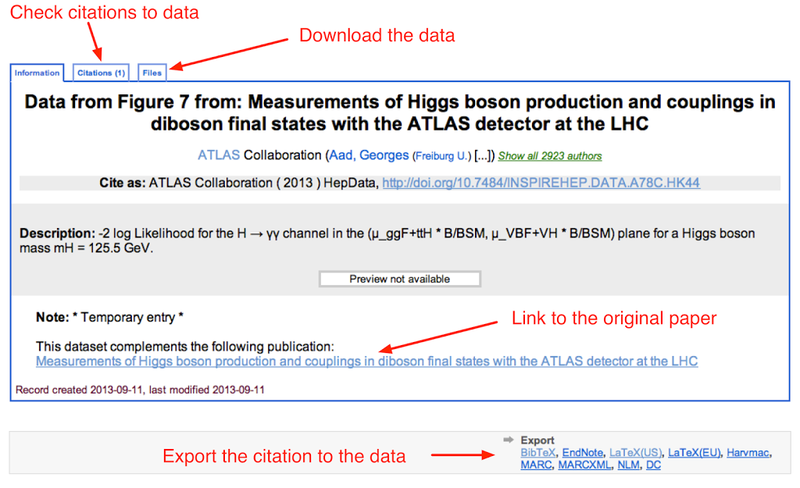 About a month ago the ATLAS experiment made the datasets behind the likelihood function associated to the Higgs boson property measurements available to the public in digital format. The datasets can be easily accessed on INSPIRE. More about the Nobel prize in today’s CERN press release. We are familiar with the critical role of INSPIRE in searching for papers, following references, tracking citations, and providing author profiles. Now INSPIRE is taking steps to extend this service to data, thus creating a rich new layer to the information system of high energy physics. Historically, papers have been the primary means for scientific communication; however, it is common to augment papers with data. The Durham HepData project has hosted this type of data for several years, and since last year, HepData is integrated with INSPIRE. Some papers have several datasets associated to it, so each dataset is given a unique, persistent Digital Object Identifier (DOI). Not only do these DOIs ensure that you can find the data, but they also provide a clear way to cite the data. In addition to data coming from HepData, INSPIRE now supports data hosted in other third-party data repositories such as Figshare or The Dataverse Network. To test this out, I put some data from a phenomenological study of the CMSSM onto Dataverse — yes, theorists create data too! In this case, Dataverse issued the persistent identifier to our data since they take on the responsibility to store it. I sent the persistent identifier to INSPIRE and now it shows up in the data tab of our original paper. INSPIRE can now track citations to this data, which is hosted remotely. Nice! The last example comes from a not-so-high-energy experiment I was involved in called APEX Jefferson Lab, which is searching for evidence of a 5th fundamental force of nature together with similar experiments such as DarkLight, HPS, and MAMI. Unlike the enormous LHC experiments, APEX had 66 collaborators that contributed to the test-run for this small, special-purpose experiment. The results of the test run were published in 2011, and this week the raw mass distribution from those 770,509 events collected by APEX was released directly on INSPIRE. These three examples illustrate the diversity of data in HEP ranging from low-level experimental data, to theoretical predictions, to the results of statistical analysis. They also demonstrate the richness of the data layer and the need for a robust information system. Looking to the future, we can imagine an extended author profile that includes details on datasets analogous to what we are already have with papers. Datasets from HepData are now integrated into INSPIRE. HepData is a data repository hosted at Durham University which aggregates data extracted from publications in HEP and other datasets made available by the experiments. The data is presented in tables and available as data files for further reuse (plain format on INSPIRE; more formats are available on HepData). With the integration of HepData into INSPIRE, you can access data sets from HepData directly when browsing bibliographical records. If a record on INSPIRE has data from HepData attached, a corresponding tab is displayed next to the references and citation tabs. About 50,000 data files attached to about 7,000 records are available which are stored as regular records in INSPIRE. Datasets from 2012 e.g. can be found here. What do you think about this new feature included in INSPIRE? We are looking forward to your feedback at feedback@inspirehep.net.